This is Karl von Spruner's 1855 map of Africa 'since the beginning of the 15th century.' Two insets include, at left, 'The Colonies of the Gold Coast,' and below that, 'Al Magreb' (northwest Africa) 'after Leo Africanus,' the Moorish diplomat and author best known for his book Descrittione dell'Africa ('Description of Africa') describing the geography of North Africa. Relief is shown by hachures, and historical dates appear throughout. This would make a nice companion piece to Plates 11& 12, showing Africa up to the Arab conquests in the 7th century, and again from the 8th century until the Portuguese arrive in the 14th century. Relief is shown by hachures, and the finely engraved detail throughout exhibits the exquisite craftsmanship for which the Perthes firm is best known. 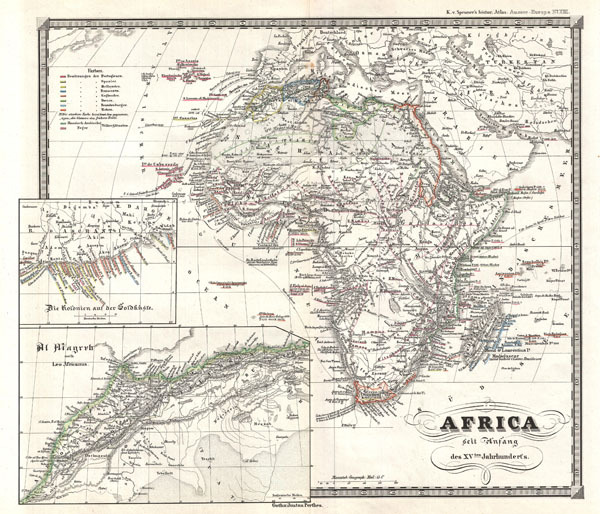 Justus Perthes published the map as plate number 13 in Dr. Karl von Spruner's 1855 Historisch-Geographischer Hand-Atlas zur Geschichte Asiens, Africa's, America's und Australiens, also known as Histor. Atlas. Ausser Europa. Spruner, Karl von, Historisch-Geographischer Hand-Atlas zur Geschichte Asiens, Africa's, America's und Australiens. (Gotha: Justus Perthes), 1855. Phillips (atlases) 151. National Library of Australia, MAP Ra 140 Plate 13.